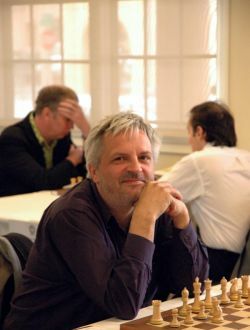 The United States Chess Federation - GM Aleksander Wojtkiewicz dies. Memories, Life and Games. Home Page Chess Life Online 2006 July GM Aleksander Wojtkiewicz dies. Memories, Life and Games. GM Aleksander Wojtkiewicz dies. Memories, Life and Games. Chess Life Online is very sad to report that Grandmaster Aleksander Wojtkiewicz passed away late in the afternoon on Friday, July 14. He died in Saint Agnes Hospital in Baltimore, Maryland. He was 43. Aleksander left on the top of his game. He won the last five tournaments he played in, including clear first in the National Open and a tie for first at the World Open. Aleksander was born in Riga on January 15,1963 to a Russian mother and Polish father. He was an only child. His father, Pavel Wojtkiewicz was a master level chess player best known for his blitz play and hustling. Aleks wanted his ashes to buried next to his father's in Latvia. Pavel also died very young, at the age of 45. Aleksander was one of the most talented players of his generation. In his teens Aleks worked with the legendary world champion, Mikhail Tal who recognized his positional talent. As a mature GM, Aleks was revered by peers for his "subtle positional feelings", as childhood friend Alexander Shabalov put it. His solid but lethal white opening repretoire was so well prepared that masters with the misfortune to be paired with black against Aleks often emitted audible groans. With black he took more chances, and was a practitioner of two very sharp openings: the Najdorf and the King's Indian. Aleksander's uncompromising anti-communist beliefs led to a hiatus in his chess career. In 1982, he began a five-year dodge of the Soviet Army, spending much of his time in the St.Petersburg underworld. In 1986, tired of running, he turned himself in and accepted a two-year sentence in a Latvian jail. In jail, Aleksander was assigned a job as a photographer, an often-traumatic position in which he'd photograph ghastly prison crimes. He studied chess during his prison time, even finding a novelty in the Accelerated Dragon. Alexei Shirov heard about it through Shabalov. Shirov went on to win with it against fellow super-GM Adams. 10...Kxf7, instead of the normal Rxf7 was Wojt's surprising discovery. The move was coined the "Prison Novelty." Aleksander was released from jail in the summer of 1987, half a year short of his two-year sentence. Officially, his early release was due to good behavior. Soon after, Aleksander moved to Poland. He became a Grandmaster in 1989 and won two Polish Championships. He had a son, Josef with Lithuanian chess player Laima Domarkaite. Later they had a falling out, and Aleks was sad at how little contact he had with Josef. Sponsorship from the Polish Airline, Lot, allowed him to travel around the world playing in tournaments. It was typical for Aleks to travel back and forth across the Atlantic several times a month. He began to make frequent appearances in American tournaments, and immediately took a liking to the American lifestyle. In the late nineties, arguments between Aleks and former communists heading the Polish Chess Federation resulted in Aleks being banned from representing Poland in international tournaments. Because of this, Aleks moved to the United States in 1998 and enrolled in University of Maryland Baltimore County in 2001. In 2002, he officially switched federations. He played in numerous weekend tournaments in America. He won the Grand Prix first prize six times in a row. (Grand Prix is sponsored by chesscafe. Points are awarded at major American events, and the number awarded is proportionate to the importance and size of the tournament. The winner each year takes home a cash prize of 10,000$.) At the time of his death, he was leading once again for 2006. Close behind was his housemate and fellow bon vivant Grandmaster Jaan Ehlvest. Aleks was known for his charming personality and wild lifestyle. His girlfriend, Amber Berglund recalled her first sight of him "He had an essence of elegance, even though he was dressed in rags." Amber describes Aleks' passionate approach to life: "Aleks was the Dionysus of Chess. He was Rock & Roll. He was passionate, emotional, defiant, deeply gifted, cultured and sometimes crude and uncouth. He loved, he hated, he raged, he lived life like it was going out of style. And for him, it was. He was a ball of heavenly hell-fire. He burned bright and his light went out too soon." He was also very loved by his students, many of whom came to speak at his memorial service at the Fells Point Chess Club (in Baltimore, Maryland) on July 17. One, expert player Kevin McPherson recalled the tough love approach of "Wojo", as he is called by Americans. (Russians call him Wojt): Kevin was really proud of his games from the World Open, and couldn't wait to show them to Aleks. Wojtkiewicz went through them, laughing and asking on nearly every move: "Why didn't you play here?" Aleks then paused after one move and said: "Kevin, I've been teaching you for four years, you've spent thousands on chess lessons and finally, you play a good move!" "He was an extraordinary teacher. I've never analyzed with anyone who had such a deep understanding of chess. He could look at a position from a game I played and immediately explain what the most important ideas were, and then show me several seemingly different positions with the same idea." Aleks is survived by his son Josef and his mother, Tamara. Please send donations to the address below to support Aleks' last two wishes, to see that his mother would continue to be taken care of (He sent her money regularly) and to be buried next to his father in Latvia.